– The Polk County History Center hosts a monthly book club, which meets on the first and second Tuesdays of each month. – April’s book: “Central Florida’s Civil War Veterans,” Bob Grenier. – The Imperial Symphony Orchestra presents “Celebrating 50 Years with the ISO,” a performance to be held at The Lakeland Center. – ISO is a community orchestra comprised of 80 volunteer musicians, who have made it their mission to entertain, educate and inspire audiences through enlightening performances of symphonic music. – Bok Tower Gardens’ “Lunch & Learn” programs are designed to help Florida residents learn the best practices and methods to garden successfully. – April 16 Lunch & Learn: Explore the life of Sandhill Cranes with Lake Region Audubon Society’s Reinier Munguia, and learn how to coexist with these birds to ensure their survival. – Session takes place in the Magnolia Room inside the Visitor Center. Bring your lunch or purchase one from the Blue Palmetto Cafe. – Harrison School for the Arts’ Theatre Department students are proud to present Bus Stop, a drama. The play is set in a diner in rural Kansas, about 25 miles west of Kansas City, Missouri during a snowstorm from which bus passengers must take shelter. -Performed on Thursday, April 16 – April 18 at 7:30 p.m. in the Black Box Theatre at Harrison. Sunday, April 19 matinee at 2:00 p.m.
-Calling all four-legged friends of Main Street Winter Haven to Bark in the Park 2015, a FREE event. -This fun, furry event will transform Downtown Winter Haven’s Central Park into a Pooch’s Paradise, complete with “doggie” vendors, live music, great food and drinks, and lots more. You won’t want to miss this year’s Wiener Dog Races…every year this floppy, four-legged battle gets more competitive! -This inaugural FREE event is sure to pull at your heartstrings, as it highlights arts and culture. Enjoy music from Fort Meade’s very own Justin Grimes, as well as Voice of the People Performing Arts and Chamber Music Series artists Eddie Cooper and the Joe Willy Band. -Bring your appetite! Food trucks will be onsite with a variety of delicious offerings. -Main Street Bartow’s Friday Fest is a downtown Bartow block party featuring live music, vendor booths, children’s fun activities, great food, beer and other drinks. Also included is the Friday Fest Cruise-in Car Show with dash plaque awards for the first entrants. -Bartow’s monthly Uptown Yard Sale & Flea Market is a community event. -Look for it in its new location along the 300 block of East Main Street in Bartow. -The Judd Jog 5K is a family friendly event that takes place at the Polk County Sheriff’s Office Southwest District Command, Polk State College Campus, and Fort Fraser Trail. – Additional activities will include Polk County Sheriff’s Office Special Operations vehicles on display, canine meet and greet and more! – Take a personalized Tram tour of Banana Creek Marsh at Circle B, and learn about plants, birds and the property’s history. 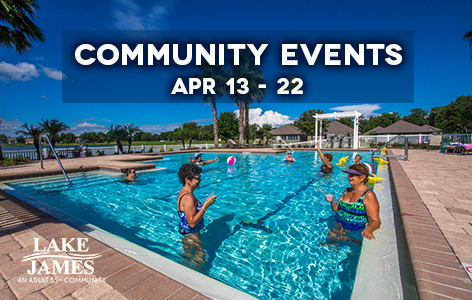 -Polk County Parks & Recreation’s annual Good Ol’ Days Festival is free family event that invites the whole family to celebrate the local history of Florida. The Good Ol’ Days Festival will feature vendors, historical interpretation, demonstrators, re-enactors of the early 1900’s, live entertainment, and much more. -A FREE community event featuring more than 50 local and talented artists from Polk County and surrounding areas, live music, food trucks, and raffle tickets. Artisans will be competing for cash prizes and selling their artwork, too. -The community will experience and meet great artists who work with paintings, glass, ceramics, photography, mixed media, wood, metal, recycled art, sculptures, and much more. -Join True Blue Winery during their 3rd Annual Blueberry Festival, celebrating all things blueberry, including wine and beer. Sample True Blue Winery’s own blueberry wine as well as other wines and beers they carry. -Celebrate Earth Day at Lake Kissimmee State Park. Join a park ranger and make some neat crafts using recyclable materials that have been found in the park. -Explore the Old Polk County Courthouse and learn more about Neo-Classical architecture with Polk County History Center’s new architectural tours, held on the third Saturday of each month. -The Old Polk County Courthouse was added to the National Register of Historic Places on August 7, 1989. -The Cypress Gardens Water Ski Team (reestablished in 2012 by former theme park employees) is back and has a new home on Lake Silver in Winter Haven, FL. -Concessions with snacks, drinks, t-shirts and hats will be available for sale. Bring a blanket or lawn chair for seating. -Voices of the People stages numerous performances featuring high caliber artists across Polk County. – The April 18 performance will take place at Polk State Lake Wales Arts Center, and features Messaien’s “Quartet for the End of Time” with David Sapadin, clarinet; Derek Menchan, cello; Byron Marc Sean, piano; and Francisco Salazar Vara, violin. -Come out The Lakeland Center and see Lakeland’s own Ultimate Indoor Football team, the Florida Marine Raiders, take on the Georgia Rampage. -It’s a night of fast paced, fan-friendly professional football. – Polk’s Nature Discovery Center at Circle B Bar Reserve presents Nature Fun Day, a family friendly event! -April’s theme is Earth Day: Learn and interact with all the beautiful things that are found out at Circle B Bar Reserve, while discovering all of the interesting ways to help conserve water with your family, recycle used containers, and GO GREEN! -Lakeland’s First Presbyterian Church hosts its Performing Arts Series for the 2014-2015 season. -April’s performance is Songs of Life: Hymns for the Journey, which is inspired by the poetry of Susan Palo Cherwien. The Chancel Choir of First Presbyterian Church will present a concert of hymns that illuminate the Gospel with songs that illustrate birth, baptism, sorrow, and hope to provide a distinctive musical voyage depicting the life of a true believer. -Guest soloists and congregational singing will be included in this unique concert. Robert Irvine LIVE is a high energy, multimedia and multi-sensory theatrical experience performed at The Lakeland Center. It’s more than just a cooking demo, It’s an interactive show that provides multiple opportunities for audience participation, and a chance to witness the challenging nature of the TV show, Dinner: Impossible, come to life right before your eyes. -In each segment of the show Robert will face a new and unique culinary challenge. Are you ready to experience the impossible? -The museum invites guests to bring lunch and listen to a guest speaker on the third Tuesday every month. -Aviation enthusiasts know it is the 2nd largest airshow in the world and Florida’s largest convention. More than 200,000 people converge in Polk County to see an airshow, visit 500 exhibits, earn education credits at workshops and forums, introduce children to the world of aviation and view more than 4,500 aircraft from homebuilts to warbirds on 2,200 acres. -Two evening air shows offer spectators an illuminated sky set to music and narration. Daily air shows on the SUN ‘n FUN grounds, evening programs and entertainment, food vendors, airplane rides, youth programming and a Seaplane event at Fantasy of Flight also attract foreign visitors and media to the annual event. – No Celtic Thunder show would be complete without a performance of their rousing anthems “Caledonia” and of course, “Ireland’s Call”, which never fails to bring the audience to its feet.